Saint Louis FC’s Austin Martz sped toward the ball against LA Galaxy II on April 14. Martz is participating in a program that gives children from low-income families an opportunity to play at camps, clinics and with a club team. 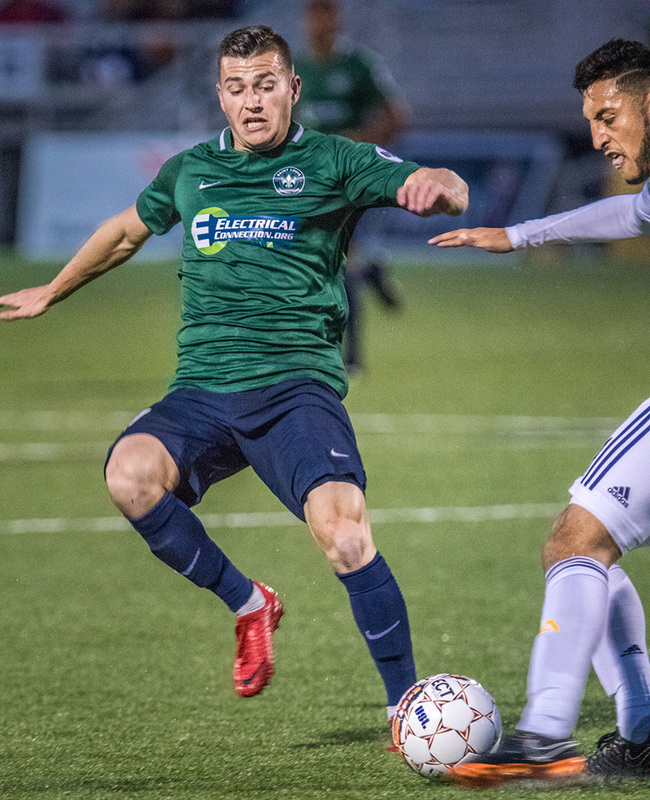 Jack Maher signed with Saint Louis FC, a professional soccer team based in Fenton, at the start of the 2017 season and made an appearance in the final game of the season. He’s on the team again this year. That’s a good reason for the Althoff Catholic High School senior to miss some classes while he practices with the team on weekdays. Up to five players may be part of a non-professional academy program within an MLS organization and earn minutes with the USL team without relinquishing their amateur status. He’s found a good fit also with the professional team. He can’t always tell what, if any, faith or religious background other players have, but a significant number of players express their faith by their actions and conversations. It’s all part of what Maher calls a very open and caring atmosphere that stems from the team’s coach, Anthony Pulis, who also is Catholic. Maher, who will play at the University of Indiana in the fall, said it’s easy to have a deep conversation with players such as Austin Martz or Sam Fink. Martz joined St. Louis FC last fall. A Pennsylvania native, he attended Georgetown University. He reads the Bible every day and attends a weekly Bible study with some of his teammates and the team chaplain. After moving back to the United States from playing soccer in Malta, Martz read a Bible passage about giving with a generous heart. He prayed about it, and a couple hours later a friend called and mentioned the ministry he and his wife were doing at Westchester University in Pennsylvania. Martz linked that with his Bible reading and donated 10 percent of his salary to their work and ended up meeting his wife because of it. Among other things, the Ambassadors program gives children from low-income families an opportunity to play at camps, clinics and with a club team. Other players from St. Louis FC have other charitable causes that they support, he noted. He used to play as an outlet for anger, but now with a focus on God, he plays with more freedom, he said. On May 1, 2014, the USL announced an expansion to St. Louis for the 2015 season. St. Louis Scott Gallagher, a St. Louis youth club, was announced as the owner and operator of the new Saint Louis FC. Both the youth club and the pro team are based at the Worldwide Technology Soccer Park in Fenton. Saint Louis FC adopted a logo that has strong ties to the foundation of the city. The fleur-de-lis that acts as the focal point of the logo is a tribute to the French founders of the city, and 1764 is a reference to the year the city was founded. The team’s next home game is at 7:30 p.m. Saturday, May 5. For information, visit www.saintlouisfc.com. For information on Ambassadors Football, visit www.stlouisreview.com/jff.